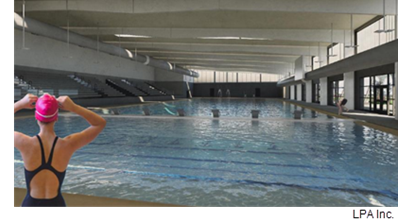 The 41,000-sf Robbins Natatorium will be on the campus of Robbins Academy and next to the Alamo Heights Tennis Center, near the corner of Trafalgar Rd. and Jones Maltsberger Rd. According to TDLR filings, the project will cost an estimated $17 million and will break ground in March 2018 and should wrap up in July 2018. The natatorium will not only be open for district functions, but also for city, state and national use as well, according to Mike Hagar, AHISD's assistant superintendent of business and finance.